Full schedule will be released following evaluations and team selections. Players will be evaluated and placed on teams determined by Body Zone coaching staff. The goal of this league format is to scramble players each week to give them an opportunity to play with new teammates. Both divisions will offer multiple game formats that will be used to offer a changing, fun and developmental experience with cross-ice, half-ice, split ice and full-ice game formats. Please contact Terry Denike to register. – All players must provide their birth year when registering. – This is a USA Hockey Sanctioned League, therefore proof of USA Hockey membership is required. Be sure to include your registration number in the comment section of the registration! Terry Denike is Body Zone’s Director of Learn to Play Hockey. He brings an outstanding track record and much sought after experience as an instructor to the Complex’s Learn to Play Hockey program. He was also an accomplished amateur, collegiate and professional player. He is a Level 4 certified USA Hockey Coach. Since 2011 he has owned and operated Denike Goaltending Development. DGD calls Body Zone’s rinks home. They have successfully instilled fundamentals that have allowed students to build a foundation to help them expand their talents in the future. Body Zone’s Learn to Play Hockey program is not just for goalies. BZ welcomes kids interested in playing any position. Denike played professionally for five seasons. He made his professional debut with the Reading Royals during the 2003-2004 ECHL season and concluded his career with Reading in 2007-2008. In between he played for Fresno, Dayton and Wheeling in the ECHL, Wichita in the CHL and Jacksonville, Macon and Florida in the SPHL. A goalie, he had a career goals against average of 3.14 and save percentage of .904. 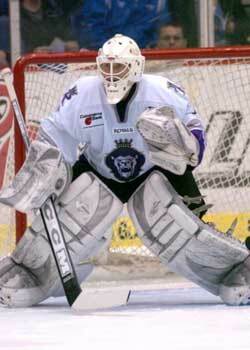 In 2005-2006 with the Florida Seals he was the SPHL’s Top Goalie award winner and team MVP. He won the ECHL’s Goaltender of the Week Award twice with Reading in 2007. During his career as an amateur and pro he earned a total of six Most Popular Player, Most Inspirational Player and Community Service Awards – including the Royals Community Service Award in 2007-2008. As an amateur Denike player minor hockey for the Oakville Rangers and Mississauga Senators and juniors for the Weyburn Redwings of the SJHL Jr. A tier 2. Collegiately he earned a full scholarship to NCAA Division I Lake Superior State where he studied Fire Science. Denike was selected in the 5th round of the 2001 NHL draft by the Los Angeles Kings. He was born in Mississauga, Ontario.